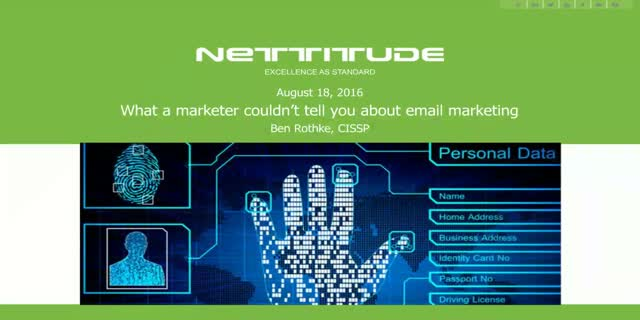 As a Senior eGRC Consultant at the Nettitude Group, Ben Rothke knows little about how to create a successful email marketing campaign. But as someone who has received tens of thousands of emails from such campaigns, he’s seen what works and what doesn’t. In this webinar, Ben will share some of the worst email fails he has received, which immediately went into the deleted folder. He’ll also share those emails that were effective, and resulted in a successful follow-up for the sender. There is a misconception that infusing automation into the customer experience will make it less human, and thus less relatable, to consumers. On the contrary, companies are pioneering AI technologies to enable them to gain a deeper understanding of the people they serve, resulting in experiences that are more relevant, personal, emotional, and ultimately rewarding--for customer and company alike. Join Assaf Baciu, head of product and co-founder of Persado, who will demonstrate how Fortune 1000 brands are leveraging machine learning to create emotional relationships with their audiences. Everybody is talking about LinkedIn as the best tool for B2B marketing. Is it? You have a profile and company page, but for some reason you see no results. Why? This presentation will provide a comprehensive overview of all of LinkedIn’s marketing tools and products. • Have a LinkedIn profile that helps you find that new job, grow your career, and attract new business. • Make your LinkedIn Company page a real asset and use it to drive traffic to your website via advertising and then convert via retargeting. • Write InMails that get responses. • Position yourself as a thought leader so you don’t have to sell but can be a trusted advisor. In addition, you’ll gain insights into LinkedIn’s demographics around the world and the future vision for LinkedIn as part of Microsoft. Often B2B marketers will focus heavily on the generation aspect of lead generation and lose sight of what happens next. Generating new leads is one thing, but nurturing them to qualify themselves is what separates a lead in your funnel from a customer tied to revenue. Join Ian Campbell, CEO, Mission Suite as he breaks down a lead generation and management process that generates results at the bottom of the funnel. Beginning a video marketing campaign can be daunting, in this webinar we will discuss what to expect when hiring a video production company, where to look for inspiration within your business, and how to leverage one video shoot into multiple pieces of content. Traditional digital advertising channels are delivering declining results, forcing marketers to look for new alternatives that deliver better ROI. Influencer marketing has emerged as a powerful new addition to the marketing mix. Brian Solis is principal analyst at Altimeter Group (a Prophet company). Solis is globally recognized as one of the most prominent thought leaders, speakers, and published authors in new technology, digital marketing and culture shifts. In a digital world where customers have all the power and everyone is a publisher, increasingly high competition and standards are pressuring marketing teams into a race to produce higher quality content, in greater volumes, and at a faster rate than ever before, often with the same amount of resources. But while content is the fuel for every digital marketing engine, not everyone gets the same mileage out of it. A 2016 report from Content Marketing Institute found that while 88% of B2B organizations are using content marketing, only 30% rated their content efforts as being effective for reaching their goals. Shoppers have an unlimited number of retail apps that promise to deliver the right product at the right price at the right time. The latest and greatest app bells and whistles may attract the new user, but developing them into a long-term follower/ user is easier said than done. It’s easier to get them then to keep them, after all. With an increasing number of apps on a user’s device, app marketers are challenged to draw the user's attention not only through efficient user acquisition initiatives, but also via engagement and retention activities. Leveraging marketing automation technology to increase user lifetime value and minimize cost per install is the crux of the issue. Let VentureBeat’s panel of experts shed light on how to use marketing automation to implement acquisition strategies that work. By identifying synergies between acquisition and user engagement, this webinar hits the high points of reactivation tactics (via push, email, retargeting). Join Jason Allen from mega-retailer GameStop and Marissa Tarelton from RetailMeNot as they discuss how to increase LTV and lower CPI. Register today for this free VB Live event! If you’re an app product manager or marketer without a robust strategy to increase ARPU and raise LTV, you’re leaving money on the table. Whether because of poor engagement, low social engagement, or poor user interface, your app limitations are costing you money. Everyone knows that the difference between success and failure in mobile app business is long-term customer engagement and higher LTV, but lighting a fire in the hearts of consumers is easier said than done. From app discovery to customer retention to long term value, finding the right combination of strategies to build massively effective customer engagement is part art and part science. Register for this free executive level learning opportunity today! Almost every B2B marketer has experience leveraging eBooks. eBooks are an effective way to provide rich content while creating a fun experience for your audience; however, running the same eBook creation and promotion process over and over again can get boring (for both you and your audience). In this webinar, SnapApp joins us to discuss three ways you can transform eBooks to engage your buyers at every stage of their journey to boost your B2B marketing results. In today's world, sales and marketing professionals are implementing account-based marketing (ABM) strategies to win new business and create lasting relationships. In this webinar (part of our ABM Hacks webinar series), Marketo's ABM expert Charm Bianchini shares five easy steps to use ABM to drive demand and generate revenue within target accounts. In an era of digital interactive lifestyles, marketers must shift to a new world of engagement marketing that captivates rather than commandeers audiences. By implementing timely, relevant and unified campaigns across multiple channels, marketers can transform information into understanding and understanding into lifetime customer relationships and high marketing return-on-investment. Silverpop shows you how you can create, nurture and maintain customer relationships, improve response rates, help sales close more business and demonstrate the power and value of your marketing organization. Communications technologies continually evolve and branch in new directions, challenging modern marketers to keep up. Now you can stay ahead of the changes with the strategies and tactics offered by the Silverpop Engagement Marketing Channel. Subscribe today!